More than 100 years ago, bison were slaughtered by the millions. 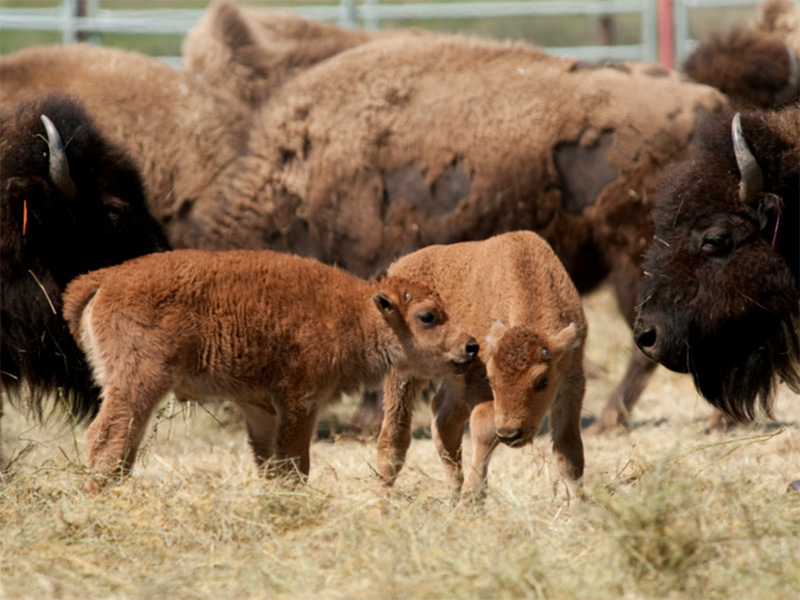 In the spring of 2012, the great herds were being re-born on the Great Plains—one baby at a time. For more than a decade, Earthjustice has been fighting to protect bison in and around Yellowstone National Park. Now as the bison are returning to the ranges of Northeast Montana, we are continuing to fight for this magnificent creature on Indian reservations. In this video and Q&A feature, Tim Preso, managing attorney of the Earthjustice Northern Rockies office, explains the role of Earthjustice in restoring wild bison to open ranges where they once roamed in the millions. Why bring bison to the Fort Peck Indian Reservation? We are at a pivotal moment for bison conservation in Montana. For the first time ever, the State of Montana has transplanted wild bison from their refuge in Yellowstone National Park to their native habitat on the Great Plains. It's an historic step, but it has not gone unchallenged. Livestock interests and their allies have sued to reverse the restoration of bison on the Fort Peck Indian Reservation and kill the larger bison restoration program in its infancy. We've stepped in to defend the restoration program and make sure it succeeds as what we hope will be the first of many efforts to bring bison to the plains. The livestock industry helped exterminate bison in the 1800's. Why are they still at it? For the livestock industry, a range cleared of bison is a range ready for cattle, and that dynamic has not changed in more than 100 years. Restoration of bison to their range is perceived as a threat by the livestock industry, even though the bison that have been restored to Fort Peck will be contained on tribal land and will not be allowed to roam on surrounding private ranches. What role does Earthjustice play? The legal term for what we are doing is an intervention in the livestock industry lawsuit. We are defending against the ranchers' claims. We see this as an opportunity to go toe to toe with them over the fate of the bison re-introduction program. Currently, we are squaring off against them in the Montana Supreme Court. Our clients are Defenders of Wildlife and the National Wildlife Federation, and we are also working closely with the affected American Indian tribes. We aren't trying to put 30 million bison back on the plains, but there are plenty of places where wild bison can be restored. Aside from tribal lands such as the reservations, there are public lands in Montana owned by all Americans. The choice is whether they are for cattle or whether some of them might be better used to restore bison that are part of our nation's wildlife heritage. How long has Earthjustice been protecting bison? Yellowstone National Park is where a few surviving wild bison were found after they had been exterminated elsewhere in the late 1800's. For many years we have been fighting to provide bison in Yellowstone room to roam when they cross park boundaries. During the harsh winters, bison seek lower elevation land for the forage they need to survive. But for years Montana has driven them back or killed them. In the past 5 years, we have made significant progress and have been in court to defend the progress we made. A gift to Earthjustice does double duty, supporting our work and adding clout to the many environmental and community organizations we represent.